BENGALURU (Jan 18): Most Southeast Asian stock markets inched higher on Wednesday, as investors picked up exporter shares after U.S. President-elect Donald Trump expressed concerns over a stronger dollar. In an interview with the Wall Street Journal, Trump said U.S. companies "can't compete with (China) now, because our currency is strong and it's killing us." The dollar index, which measures the greenback against six major peers, last stood at 100.41, up 0.1%, after falling to 100.26 on Tuesday, its lowest since Dec 8. "At the current level that the dollar has reached from six months ago, I think it is already high enough to invite some investments into exporting countries," said Joseph Roxas, president of Manila-based Eagle Equities Inc. Sentiment was also boosted by oil prices which edged higher with a weaker dollar underpinning markets, although gains were limited by expectations that U.S. producers would boost output. MSCI's ex-Japan Asia-Pacific shares index rose 0.3%, just shy of a three-month high hit last Thursday. Philippine stocks rose nearly half a percent and were on track to snap five straight sessions of falls, powered by industrial and real estate stocks. "Philippines is rebounding a bit, after few days of corrections. Last few days were really just corrections. We did not even break 7,100 (level)," Roxas said. In other markets, Jakarta was headed for its first rise in eight sessions, on the back of gains in consumer staples and financials. Advancing issues outnumbered declining ones on the benchmark index by two to one. 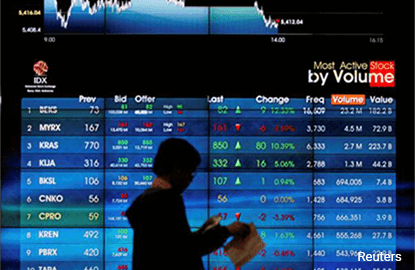 Malaysian stocks nudged higher, with gains recorded across most sectors. Malaysian palm oil futures rose more than 1.5% on Tuesday, tracking gains in rival oilseed soy and supported by bullish sentiment on tight market supplies in the evening. Bucking the trend, Singapore was headed for a third straight session of falls, with financials accounting for more than half of the losses. United Overseas Bank Ltd, the city-state's third-biggest lender, fell as much as 1.9% in its biggest intraday percentage loss in nearly eight weeks.